Remember those old school carrot salads loaded with mayo and raisins? You either loved it or hated it, and I think I was somewhere in between. Well, this recipe takes that lunchbox staple and turns it into something fresh, summery, and absolutely delicious. This salad is also a lot easier than you think to make. Yes, you can buy pregrated carrots, but why not save money and buy whole carrots and shred them in a food processor yourself? (Yes, I am a firm believer in food processors.) I only used about 4 whole carrots, added the grating attachment to the processor bowl, and grated away. Each carrot is whittled down to its base in a matter of seconds. So easy! 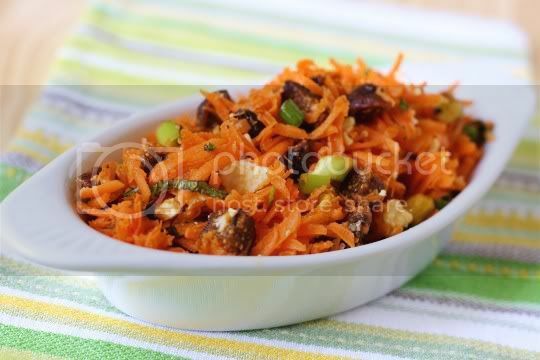 Once that's done, simply toss the carrots together with chopped figs, sliced green onions, pistachios, and chopped fresh mint. 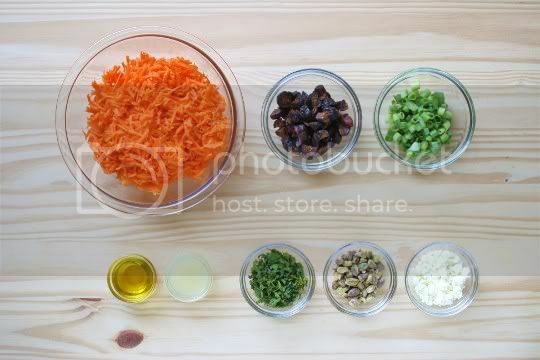 Whisk together olive oil and lemon juice, pour over the salad, and mix until everything is well coated. Finally, gently mix in crumbled feta. You can refrigerate the salad until you're ready to serve it, but I think this tastes best at room temperature. Every ingredient in this dish works so amazingly together. The carrots are crunchy, juicy, and sweet. The onions are pungent, and the bits of super sweet and chewy figs are like a treat in each bite. 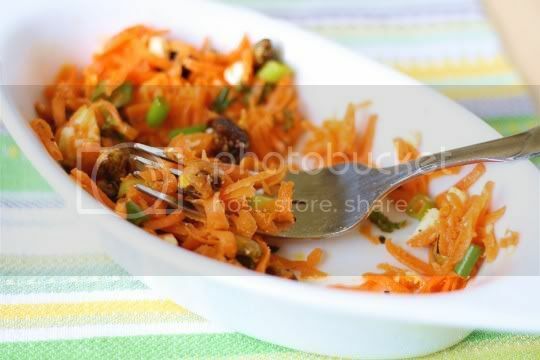 You probably can sub raisins here if you want to stick to the more classic carrot salad, but the figs are really divine. The nutty pistachios add some solid crunch and a little more sweetness, but also a creamy roasted flavor. Perhaps what I like best about this dish is that the mint doesn't overwhelm the other flavors, and serves only as a subtle herbal background. If you want to make this vegan, you probably can do just fine with omitting the feta. The lemon juice definitely adds enough tanginess to contrast with the sweetness, but the feta does add a little salty creaminess. Try adding a touch of smoked salt for a dairy-free variety. Try bringing this to your next picnic or potluck, and watch the stuff disappear! The salad would be a great side for a sandwich, or even pair it with some hummus and pita for a light meal. Make again? Yes! This may be the best mouthful of carrots you'll ever eat! Vegan variation: Omit feta, or substitute vegan cheese. Yummy salad! Very delicious! Can't wait to share this in our coming family reunion. Thanks for sharing.